After largely ignoring a conservation law passed during the last drought, some of California’s largest agricultural water districts are facing a lawsuit that would force them to measure how much water farmers use. The 2009 law was designed to push the state’s biggest water users to conserve by closely monitoring their use. 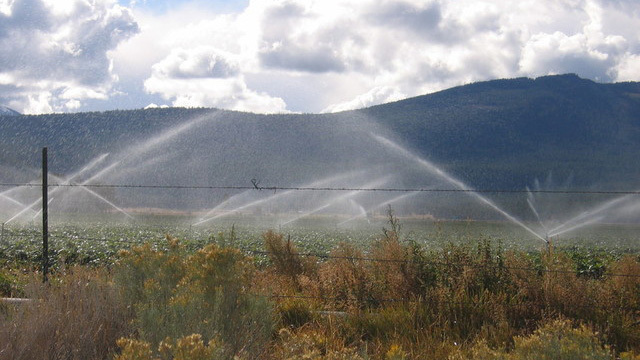 Then, the state’s agricultural water districts are supposed to charge the farmers, at least in part, based on that use. But the state doesn’t actually know how many agricultural water districts are meeting the new requirements or even inching toward doing so, because more than 20 of them have failed to turn in what’s called a water management plan. The plans were due more than 18 months ago. The Environmental Law Foundation, an Oakland nonprofit, sent letters Friday to the management of nearly two dozen districts that the state listed as not following the law. With the state facing a historic drought, the nonprofit is threatening legal action before the end of the month if districts don’t prove they’re complying. The economic theory behind the 2009 law is that if you aren’t paying for how much water you actually use, you have little incentive to use less. Most residents of California, whose water use is metered, have long seen their actual water consumption reflected in their bills. With agriculture, which accounts for 80 percent of the water that humans use in the state, it is a different story. The Environmental Law Foundation decided to file suit after The Center of Investigative Reporting revealed in May that agricultural districts were widely ignoring two water laws. Water managers at the agricultural districts in question say they’re already using water efficiently and the drought is forcing them to be even more careful. “We comply with the vast majority of what the law requires. We just haven’t filed some paperwork to document it,” said Robert Kunde, engineer-manager for the Wheeler Ridge-Maricopa Water Storage District in Bakersfield. Other districts simply decided not to bother. While districts that have not turned in their water management plans have lost access to $472 million in state grants, there is little else the state can do to force them to comply. But under the law, a third party, like the Environmental Law Foundation, can sue districts that fail to do so. 'We’ll respond. I just don’t know how yet.' -- Mark Mulkay, Western Canal Water Dist. Some districts say they’re already following the law while others say they’re getting there. Nine of the 22 districts targeted by the nonprofit have provided documentation to the group that they’re following the law and will not be sued. Ted Trimble, general manager of the Western Canal Water District in Oroville, said his district is working on creating a regional plan with other water districts in the area. Mark Mulkay, general manager of the Kern Delta Water District in Bakersfield, said his district has been measuring water deliveries and charging customers on that basis since the district was created in 1965. But he’s not sure whether the district’s water management planning meets the state requirements. This story was edited by Andrew Donohue and Robert Salladay. It was copy edited by Nikki Frick and Christine Lee. This story was produced by The Center for Investigative Reporting, an independent, nonprofit newsroom based in the San Francisco Bay Area. Mieszkowski can be reached at kmieszkowski@cironline.org. Follow her on Twitter: @kmieszkowski.